Big and bold with plenty of punch, the NR47 is a modern variation on a classic theme. A fantastic mic. A fabulous, well-balanced sound. Excellent build quality and finish. True classic looks at an affordable price. Not the brightest mic we've tested. 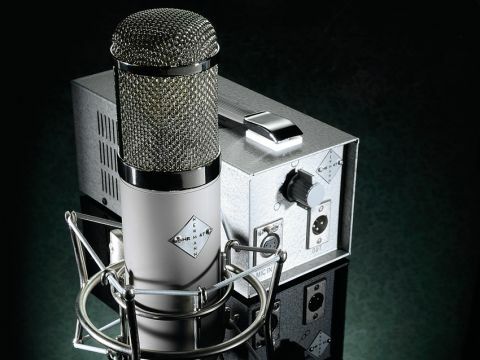 The Newmann Retro NR47 is a dual large diaphragm valve condenser mic that comes in a smart looking case. This contains the microphone in the now ubiquitous wooden box, a suitably retro looking power supply, a 7-pin XLR cable, a power cable and a suspension mount. The microphone is available in three finishes: distressed vintage matt-nickel; satin-nickel powder; or a shiny polished nickel. The power supply has a 7-pin XLR connection to the microphone, a standard XLR out, IEC mains connector and the polarity switch. This is stepped and has nine positions from figure-of-eight through cardioid to omni-directional. The suspension mount is well-made and unlike those of a few other mics we have seen recently is easy to adjust and holds its position without having to resort to a pair of pliers. Taking the microphone from its wooden case you could be mistaken for thinking you were holding a well-preserved original Neumann U47. The finish is excellent and it feels substantial. The base of the microphone screws easily into the suspension mount and balances perfectly. The first thing I put in front of the NR47 was a bass harmonica. Not the easiest of instruments to record, as you have to be close to get some proximity effect and any hint of harshness in the microphone can make it sound thin. The NR47 passed this rather unconventional test with flying colours. Powerful lows, warm mids and no nasty overtones. Next came acoustic guitar, an arch top f-hole with a tendency to sound a bit 'honky'. Here the NR47 really shone. Possibly the best depth we have ever heard from that particular instrument without any lack of mid presence and a lovely smooth top. The transient response was excellent and the guitar sat easily in the mix. From there, we went straight to vocals. We stacked up a four-part harmony using a mix of cardioid and omni patterns and the result was excellent. Great detail, as smooth as silk and very easy to EQ. This is not the brightest mic we have ever used, but it's so well balanced across the spectrum that a little EQ will bring any area forward with no nasty surprises. To their credit, Newmann Retros describe the NR47 as a homage to the great U47 and not a replacement, but by basing its design on it it could have come a cropper if it didn't deliver the goods. What the company has produced is a great microphone which may initially get noticed because of its name, but which will ultimately be loved for its own special qualities.